How can you support a new student who has little to no understanding of the English language using digital platforms? I don’t have a golden solution, but I do have some suggestions of how we can help English Language Learners in our classrooms using digital platforms. These are students who are new to our communities and we should help them achieve their academic goals. They have the same right to be successful as anybody else. I hope you leave with an idea of what tools you can use in your classroom to support not just ELL’s but all students. Technology is growing exponentially and with it are new jobs being created, therefore, training begins in our classrooms for these students futures. I was once labeled as an ELL when I began kindergarten at Pueblo Vista Elementary school. I know the struggles my current ELL’s go through not just in my class but other classes at Napa High. That’s what motivates me every day to come prepared as much as possible. Even though I believe that math is a universal language, in the classroom, homework, lecturing, projects, etc. have to be scaffolded to support ELL’s and all students. Teaching a math 1 class where levels of math ranges from middle school to 10th grade makes it difficult for us math teachers to keep up the rigor and support in the class for every single student. Therefore, I hope that my capstone can provide you with an insight of what I tried with my students with the hope that you can use some of these strategies in your own classroom to support ELL’s. The video above, explains some of my pedagogy, technology and content I integrated in my classroom throughout my time in the Innovative Learning program at Touro University. Students using Desmos online graphing calculator function to solve linear inequalities. ​In the first semester of the Innovative Learning program, I conducted research with my math 1 classes. I explored the idea of using online programs to support student learning. These tools were used around the exponential functions unit. Students explored the behaviors exponential functions had and the different ways they can be described with equations, tables and graphs. There was also a cell phone application called Remind, which is a way for students to communicate with each other and with the teacher. With the pre and post-test and the survey students completed, there was enough evidence to show that these tools and methodologies did support ELL’s and other students. ​In the second round, I applied to the same tools but in a different unit with linear equations. 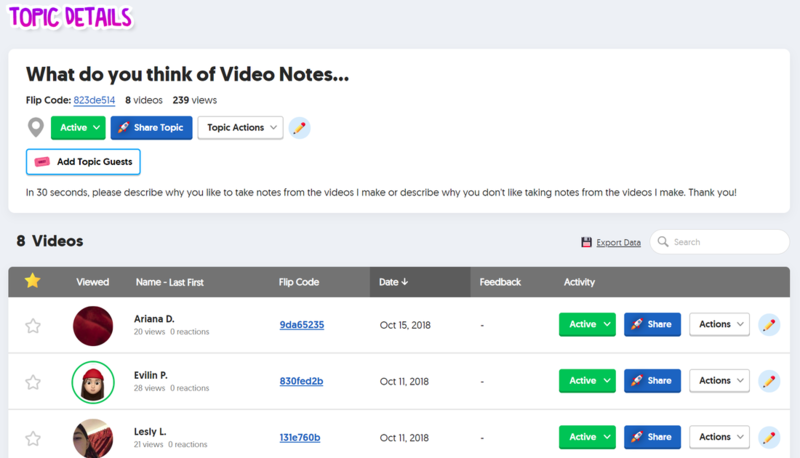 One of the new tools I applied was Flipgrid, where students uploaded their reflections on the activity we did on block day periods. Students were to reply to one of their classmates and treat the responses as blogging. Instead of giving students notes in class, I created Power Point presentations and then did a voice over as I explained the notes on the slides. Students had these videos to watch and take notes on as homework. The results this time around were not as positive as the first round. Students were choosing in not participating in the video reflections. Screen shot of the grids math 1 students had to respond to using Flipgrid.